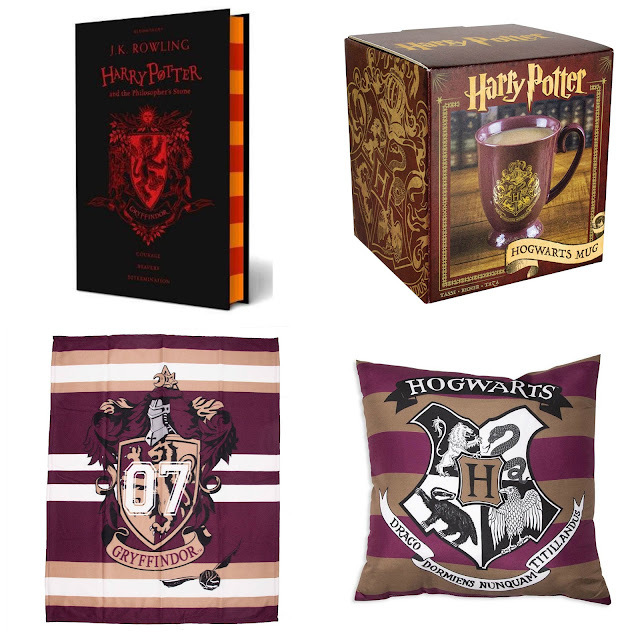 Enter this Harry Potter giveaway for a chance to win a Gryffindor hardcover book and blanket and a Hogwarts pillow and mug. Good luck! Hagrid because he is a big softie really. I love Hermione - she is my fictional inspiration for college. She valued intelligence, bravery, and equality. "Who's your favorite Harry Potter character and why?" Tom Riddle, because he has style. I love Ron Beasley. He's so loyal to his friends and has a heart of gold. I love Luna Lovegood. I love her innocence and how nothing seems to bother her. Hagrid; I love big men! I alway loved Hagrid, he hadsuch a phenomenal character. Always loved Hagrid, he's an interesting and fun character! I loved Snape the most because through every movie I knew he had a good heart. I love the Weasley twins, they're so funny! Hermione as she's so smart and brave! My favorite Harry Potter character is Neville because he grows into a caring, compassionate leader after being downtrodden for so long. He never loses himself. Awesome giveaway thanks for the chance . I love Ron as he is so funny and a good friend. Harry, he's so smart and nerdy! My favourite character is Hermione because she is smart, brave and reminds me a little of my daughter! I like Harry Potter because he's very smart. Ron Weasley is my favourite character. Although, he seems clumsy and forgettable, he turns out to be one of the most pivotal characters in the series. He even ends marrying the lovely Hermione. Hermione because she is smart and brave. Dumbledore, I love his mind and wisdom! Dobby, he's so sweet and always trying to do the right thing no matter what. Hermione, I feel so related to her, so portrayed by her. My favorite Harry Potter character has to be Harry himself because I've always felt connected to him. He grew up with such a bad family life with the Dursleys and he found a family in friends and other adults. That's how my life is! I feel like we both share the same values. Snape, he's so developed, complex and strangely relatable. Luna is great because she's not afraid to be herself always. When it comes to my favorite character, it has to be Luna Lovegood. She was unique, bold and a great friend. I really like Hermione, she is not afraid to just be herself and has a great personality! I love Dobby, because he is so innocent and so loyal and just generally very lovable! I like Harry Potter himself, Hermione, Ron, Snape, Dobby, and even Voldemort, they all have unique character and each of them is important to make the great story. ron because he is a loyal friend. Luna lovegood because she is amazing and unique. Harry is my favourite character because most of us can relate to him. I love Hermione as she inspires clever girls everywhere! I love Snape - he's so slimy and evil lol. Alan Rickman played him beautifully in the films. Luna because she is not afraid to be herself even if it’s not the norm that everyone else thinks. My favourite is Hermoine because she is opinionated and headstrong. I love Hermione and how brave and smart she is as a wizard. Hagrid because he is kind hearted. I fill connected to Hermione the most but love them all.